Given that more than a third of the food that is produced for us to eat – approximately 1.3 billion tonnes every year, finding ways to help more of that food get used is a worthy goal. On a small scale, one step we can take is storing food properly. But is it plastic or glass food storage containers that are best, both for freshness and for the environment? Plastic containers are light, and don’t break. But they are a major environmental issue. Only about 14 percent of plastic is actually recycled. It is cheaper to make new products than to recycle plastic, so companies are not incentivized to do so. Plastic containers also have health issues when heated. Two types of plasticizers, which are substances added to plastic to help stabilize and shape it, are of concern to human health: bisphenol-A (BPA) and phthalates. These substances are believed to be “endocrine disrupters,” which means they mimic human hormones and can cause chronic health risks. These can leach into the food or beverage from the plastic when it’s heated. There is also evidence that some acidic foods can cause leaching without being heated. We know that glass can be safely used for hot liquids and hot foods. Potentially harmful chemicals aren’t leaching into our meals when heated in a glass food storage container — or anytime, for that matter. Glass is cleaner than plastic. The nonporous surface of glass doesn’t absorb food and germs (and smells). Glass can be safely washed at high temperatures in your dishwasher. You can use and reuse your glass containers again and again, which ends up saving you money. With glass containers, you don’t need to wait for your food to fully cool before putting your leftovers in them. 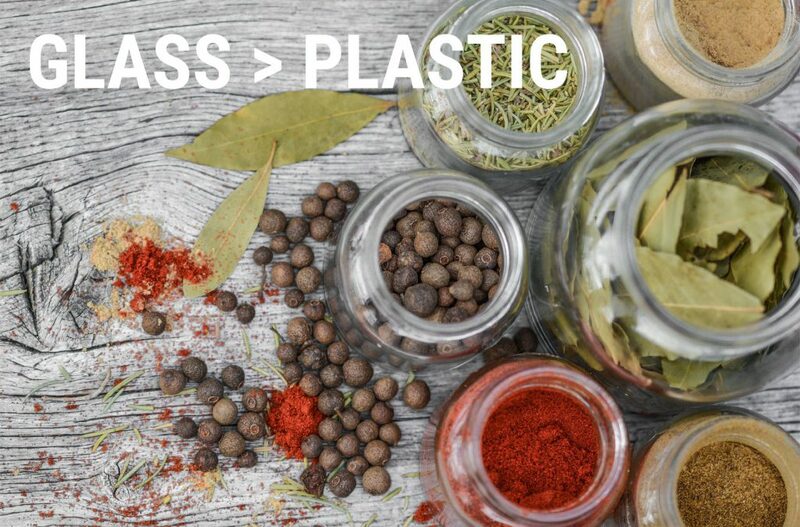 Glass lets you see what leftovers are contained inside, unlike ceramic or stainless steel containers. Since you can see inside a glass container, you are able to safely check food as it reheats without removing the lids. For me, the concern with the health risks of plastics is enough that I err on the side of caution and avoid using plastic containers. If you do decide to go the plastic container route, use them for cold food storage or dry food goods only. You should also get to know your plastics. Look on the bottom of your container to find the resin identification code, the triangle with a number in it, ranging from 1 to 7. This code lets you know what kind of plastic the container is made from. Generally, the safest choices for food use are numbers 1, 2, 4 and 5. Number 3 is vinyl or polyvinyl chloride (PVC), number 6 is polystyrene and number 7 can be a number of different plastics. Also, some plastic containers with the numbers 3 and 7 may contain BPA. Whenever possible, I recommend choosing glass food storage containers. While they’re slightly less convenient, they can be used for hot or cold food without worry and they’re ideal for home food storage. You can re-use coffee jars and other containers for free storage.